If you like the myPhone Hammer Axe Pro, you’ll probably like the Nomu S30 even more – it’s the same phone with a different logo and a 52% price cut. That said, as a mid-range ruggedized device, the Axe Pro shines thanks to a refreshing design and a good choice of components. We reviewed the Hammer Axe Pro from myPhone earlier this year. Well, not the exact model here, but the ODM (original design manufacturer) version from a Hong-Kong based vendor called Nomu. The S30, as it is known, impressed us back then thanks to a balanced combination of grunt and keen pricing (you can see the two phones next to each other in the following two screenshots below) . With a retail price of just over £173 ($230) at the time of writing (purchased from Geekbuying and including delivery but not local taxes), the Nomu S30 is indeed a bargain. However, there are instances when buying from a non-European country may not be a particularly enticing option, because of issues such as value added taxes, business support, the need for localization or other similar restrictions. That’s probably why Polish-based company myPhone chose to build its business model on “localizing” smartphones like the S30, thereby mitigating the business risks associated with buying a ruggedized smartphone from somewhere like China. (That said, you can buy the Nomu S30 for as little as £219.99 – $295 – fulfilled by Amazon). 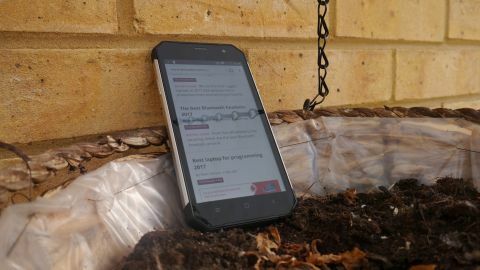 The Hammer Axe Pro is a chunky smartphone – measuring 162 x 83 x 13.35mm, and weighing 270g – but this handset is different in its look and feel from most of the competition. It eschews the traditional rubbery, utilitarian look of many of its rivals for something more subtle. The manufacturer opted for a more stylish design with a textured back – polycarbonate plastic is the dominant material used in its chassis which has a titanium alloy structure. The biggest selling point of the Hammer Axe Pro is that it is IP68-rated; this means that it should withstand being immersed in 1.5m of water for up to 30 minutes. Nomu claims that the S30 should be able to survive underwater for two hours to depths of up to 5m – and that’s likely to be the case for the Axe Pro as well. The audio connector is located at the top of the Axe Pro and the microUSB port at the other end, with both being covered by flaps which are cumbersome to remove every time you have to charge your phone or connect a pair of headphones. We’d prefer to have both located at the same end of the device, ideally. Note that the USB port doesn’t requires a USB cable with a longer-than-usual connector as is the case with many of its competitors. There’s one speaker located at the bottom of the Hammer Axe Pro. A programmable SOS key can be found on one side of the phone while the other hosts the power button and a volume rocker switch which can be used as a camera button. There are no notification lights, though. The front of the phone plays host to three capacitive buttons and there’s no fingerprint reader. Check out the original Nomu S30 review for a more detailed look at the design. Back in January, the S30 was the most powerful rugged smartphone on the market. Since then, however, Blackview’s BV8000 Pro, the Doogee S60 and the AGM X1 have surpassed it in terms of raw performance and functionality. That’s not to say that it is a run-of-the-mill handset. The Mediatek P10 system-on-a-chip is still a very capable model, clocked at 2GHz with eight cores. 4GB of system memory (LPDDR3) and 64GB of eMMC 5.1 storage means that it will easily run the latest version of Android. Connectivity-wise, you’ve got Bluetooth 4 and 802.11n Wi-Fi, and even NFC. The front-facing camera is a 5-megapixel shooter (Omnivision OV5648) while the one at the back is a 13-megapixel affair (Sony IMX214) that can record in Full HD. The phone is powered by a massive 5,000mAh battery and supports fast charging thanks to a 6V,2A charger. We couldn’t get the Hammer Axe Pro to install the latest firmware – the smartphone would crash and spew some gibberish text, which was a bit problematic. The Hammer Axe Pro runs Android 7.0 – surprisingly, Nomu itself has yet to confirm when Android 7.0 will ship for the S30. The screen is a fingerprint-magnet thanks to the lack of an oleophobic layer. Fortunately, this doesn’t apply to the rest of the chassis. We didn’t detect any noticeable lag when operating the smartphone. myPhone (and Nomu) has kept the phone remarkably bloatware-free, aside from myPhone’s own registration app. This is in stark contrast to most of the rugged smartphones we’ve tested until now. Performance is more than acceptable on the nine benchmarks we tested with. The Hammer Axe Pro is a capable mid-range smartphone, that much is clear. The Hammer Axe Pro costs £364 ($490) from Amazon, which is about twice the price of the Nomu S30, a 110% margin to be more precise. You don’t get a lot more for that premium, however, and as a result you’ll definitely be better off buying the Nomu S30 (or indeed two of them for the money). If you can live with the quirks of the original S30 and the risk associated with importing a product without local insurance, then it is an absolute no-brainer bargain. However, if you want the peace of mind associated with a local company that can give you a VAT refund, then the Axe Pro might be a better option.